We provide comprehensive indoor air quality (IAQ) services, responding to complaints, collecting data to support building evaluations, and analyzing IAQ to determine ventilation rates. Services we provide include measurement of indoor atmospheres for contaminants, carbon dioxide levels, ventilation, air distribution, odors, temperature, and humidity. When IAQ problems are found, we use a multi-disciplinary approach, with our industrial hygiene staff working together with architects and engineers, to find the cause, design needed repair work, monitor the work, and perform verification testing after repair work is complete. Indoor Air Quality investigations: We perform studies of indoor air quality. Frequently, this starts with an analysis to determine the contaminants of concern for a facility. These might include gaseous form contaminants such as carbon monoxide, VOCs, and methane, particulate such as pollen and mold spores, or liquid droplets and aerosols. Carbon dioxide is generally not a contaminant of concern, but is frequently measured as a surrogate for ventilation adequacy. Once the contaminants are identified, sampling is performed using a variety of direct read instruments, samples are collected and analyzed. We process the resulting data statistically, in order to define the quality of the indoor air with a great deal of scientific certainty. Particulate Sampling: In some situations, particularly when there are complaints of skin or eye irritation, or if there has been an event such as a ceiling collapse, mechanical failure, or nearby construction, we may collect samples on cassettes that allow analysis by both optical microscopy and scanning electron microscopy. This allows the particles found in the sample to be chemically analyzed and identified. Once the source of the irritation is found, the required repairs and remediation can be determined. Mold: Musty odors or mold are a frequent cause of complaints, particularly in hot humid climates. Most frequently, air sampling for mold will be performed using spore trapes to collect all mold spores, both viable and non-viable, as well as other materials such as cellular debris from mold, pollens, and other particulate. Mold sampling typically compares a complaint area to outdoors or a non-complaint area. Variability in mold sampling requires that multiple samples be collected in these situations, and interpreted in accordance with good scientific practices. Other materials found during air sampling for mold can be diagnostic of problems in a facility. Replacement of HVAC Equipment in Legacy Buildings: Construction materials outgas, or give off volatile organic compounds (VOCs) when first put into service. In a new building, ventilation rates must be high enough to dilute these VOCs to acceptable levels. However, in an older structure all materials have completed outgassing, and no longer emit VOCs. If this facility also is maintained with low VOC cleaning practices, it is likely that the original ventilation rates, from the earlier code with lower ventilation rates, will maintain good indoor air quality. However, the “ASHRAE Indoor Air Quality” procedure would have to be followed to meet current code requirements. Renovation Projects: During renovation projects in legacy facilities, building codes may require that ventilation rates be brought into compliance with current requirements. As with replacement of HVAC equipment in a legacy building, it is likely that legacy ventilation rates will maintain good air quality after a renovation, particularly after an initial outgassing period. To meet current code requirements this would have to be verified through the ASHREA IAQ procedure. In these instances, we may also need to determine the emission rate of new materials and develop an outgassing procedure, and perform sampling to verify the success of the procedure. In rare occasions, temporary ventilation is required during the off gassing period. Hot Humid Climates: In areas of the country with hot humid climates, the risk of developing mold growth increases as ventilation increases. For this reason, it is useful to avoid over-ventilating. Sizing ventilation to the specific requirements of a facility, by use of the ASHRAE IAQ Procedure, assures that ventilation rates will be held to the level that is required to maintain good indoor air quality in the specific facility, without excess ventilation that can lead to future mold problems. Buildings in Contaminated Environments: Buildings located in major urban areas where outdoor air quality may be poor, either continuously or episodically such as during a temperature inversion, should not be over-ventilated, as this admits more pollutants into the building that must be dealt with by the building’s mechanical system. The ASHRAE IAQ procedure allows ventilation to be custom fit to the needs of the building. In this instance, it may be worthwhile to use particulate and chemical filters to reduce ventilation rates below what can be achieved with dilute ventilation (admitting outside air) alone. Measured Ventilation Rates: We have found that, because of infiltration, the actual ventilation for a space differs from that admitted to the space by the HVAC system. Typically, actual ventilation rates for a space are higher than is determined by measuring mechanically driven air flow into and out of the space. We frequently use carbon dioxide produced by occupants as a tracer gas, and determine actual ventilation rates by analyzing the decay rate of gas concentrations when the space becomes vacant. In high rise buildings, the situation is complicated by stack effect that moves air, sometimes in large volumes, vertically through the building. These situations require specialized studies. IAQ Operations & Maintenance Programs: We set up Operations & Maintenance (O&M) Programs to maintain good indoor air quality in existing buildings. These work like a sort of early warning system. Most indoor air quality (IAQ) issues arise from reports from building occupants, rather than being discovered by building inspections or testing. The enormous range of human response to agents in the air of a building and the real possibility of false reports make it important to have an effective way of evaluating reports. We have designed proven, effective, and simple O&M programs to maintain good indoor air quality. O&M programs allow the facility owner to respond to “concerns” before they become “problems”. Implementation of an IAQ Operations & Maintenance Program helps the facility owner avoid the potential for the disaster scenarios of evacuated buildings and traumatized employees that have afflicted other, less prepared facility owners. 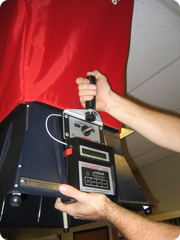 Air Flow Studies: We perform air flow studies, using a variety of measuring devices. Simple smoke tubes provide an overall view of air flows and direction, anemometers provide data on air flow velocities, micromanometers measure pressure differentials that drive air flows, flow hoods measure the quantity of air being moved by mechanical equipment, and pitot tubes measure flows in ducts and orifices in the building. We utilize the skills of our industrial hygiene and engineering staff to develop a plan to study air flow within facilities. Information from these studies permits us to more accurately evaluate indoor air quality, evaluate the uniformity of ventilation and its effect on comfort and air quality, and the efficacy of exhaust ventilation.